HALIFAX– Tuesday, Jan. 12, Halifax Selectmen met for both a dog hearing and a pole hearing, that dominated the discussion of the evening. Dog Hearing: Dating back to Nov. 18, an incident occurred at 304 Wood Street. A bicyclist, the victim, was riding his or her bike at approximately 5:05 p.m. when a dog began to chase the bicycle and bite the victim. 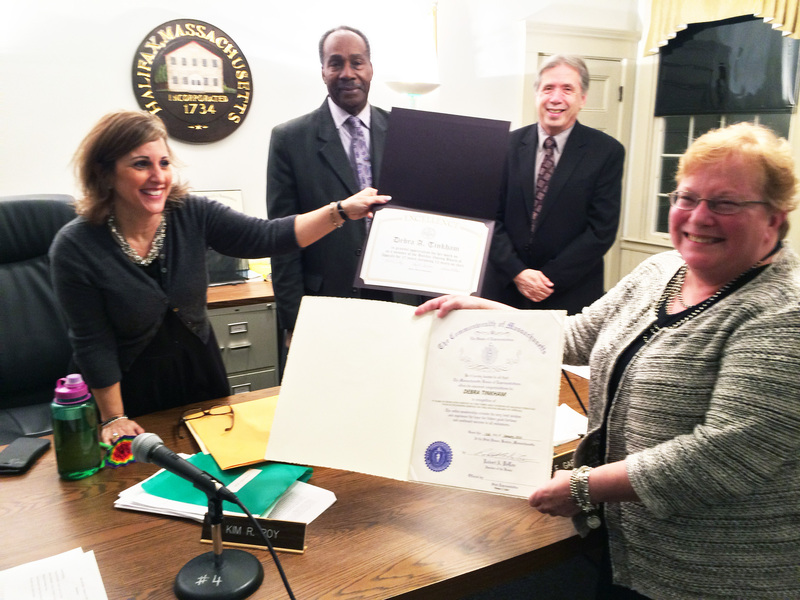 Debra Tinkham poses with the Halifax Board of Selectmen and her two certificates of appreciation for her 27 years of service on the Town’s Zoning Board. Photo by Abram Neal. Originally, the dog could not be located, but Halifax Animal Control Officer Noreen Callahan investigated and eventually located the dog at 270 Wood Street. She stated that according to an anonymous neighbor, the dog living at 270 Wood Street is often running loose. At the hearing, which became quite heated, the owner of the dog at 270 Wood Street appeared with his teenaged son, who was watching the dog at the time of the incident, along with younger siblings. The dog-owner was not home at the time of the incident. He stated that the dog was either on a chain or in a kennel at all times. Selectmen Chairman Kim Roy pointed out that this was not the first such incident with the dog, noting that in 2009 a nearly identical incident occurred with a bicyclist and a hearing was held. The dog-owner said he did not remember that hearing. The Board all in one way or another stated that it was likely not a coincidence that two such similar incidents had occurred. Roy, along with the rest of the board, asked pointed questions of the dog-owner, and cited the need to further investigate and protect the people of the Town. Roy continued the hearing with a unanimous vote of the rest of the Board to Jan. 25 at 8:45 p.m. The Board is hopeful both the victim and the neighbor will come before the Board– as they currently wish to remain anonymous– as well as the dog-owner’s wife. They pointed out to the dog-owner that he was not even home at the time of the incident, so his testimony was of relatively little use. The dog is currently licensed and vaccinated, although according to records was not in 2009 when the previous incident occurred. In Halifax, National Grid and Verizon jointly own utility poles, but Verizon sets them. The jobs are initiated by National Grid, which is attempting to improve safety in the area by moving guide wires, which help support the poles, from the trees where they are currently anchored to poles they claim are safer. A Verizon representative came before the board to get permission to do the work. About a half-dozen residents of Lingan Street and surrounding streets in “the avenues”, where several of the new poles for guide wires were slated to be placed were also present. The Verizon representative had already been researching the area, and was accommodating to the concerns of the Board and the residents. She had already spoken to several residents earlier in the day. She was quick to point out that no new guide wires were being installed; only existing ones were being moved slightly from being anchored into trees to being anchored in poles. Residents spoke passionately about how the neighborhood was congested, and contained crowded and narrow streets. They questioned whether the work was needed. Most notably, they were concerned that truck and boat-owners would continue to be able to clear the guide wires, which pass over the street. Happily, a solution that worked for everyone was eventually crafted. The most controversial pole, close to 116 Lingan Street, was denied by the Board, to the relief of the residents in the room. The guide wire will remain anchored to a tree. The board did approve a second pole on the street, near 120 Lingan Street. The others were not as controversial once everyone understood exactly what Verizon was proposing. The Board approved three guide wire poles to be installed, one each on Garden Road, Pratt Street and at Richview Avenue.